It’s time for TECHNO! Funky-Techno, perfect for Dancefloor! 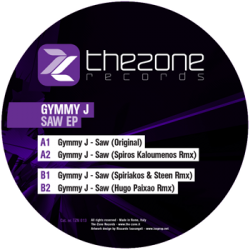 The new style techno, from The Advent’s style, coming again on The-Zone Records From Rome GYMMY J makes these incredible massive techno tune, perfect for dancefloor. With the original track SAW, we have three incredible REMIXES by great names like: Spiros Kaloumenos (MB Elektronic – Primate), Spiriakos & Steen (Naked Lunch, Skyline Type Grooves) and Hugo Paixao (Skyline Type Grooves, Dirty Planet). In Kaloumenos remix you can feel all the class of dancefloor experience with speed and groove in perfect fusion. Incredible the Spiriakos&Steen’s remix, slowly than original but incredible deep and massive with a bass really powerful…a slow&violent remix! And to close the Ep, there is one of the Skyline Type Grooves boss: Hugo Paixao, with a perfect clean techno remix when you can appreciated the style and specially the technique! For all the real TECHNO lovers!